The controversy of playing it safe: What's IDC's Smartphone Market Message? IDC released a new forecast for the worldwide smartphone market which included a long range forecast–all the way to 2015. Most people fixated on the share data in 2015. Not hard to do since whoever wrote the press release highlighted this flashy headline. 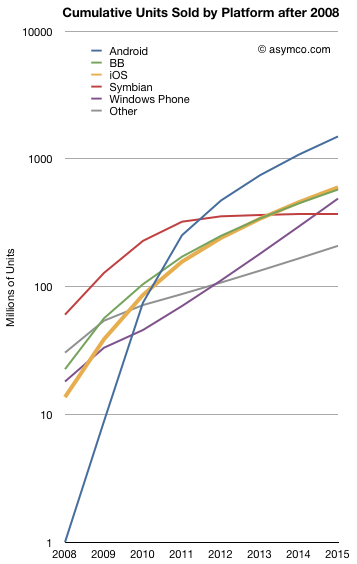 Putting aside the three significant digits of accuracy on every data point and the hard to swallow declaration that a painfully underperforming (in more ways than one) Windows Phone will overtake iOS and BlackBerry to become the second largest platform by units/year in 2015, there is much more to the report. Using only the public data from the press release we can put together a pretty good picture of the transition being forecast and determine some of the (unstated) assumptions being made. It’s these assumptions about the underlying market dynamics which illuminate far more than the falsely precise share data. The following chart shows both historic platform performance (which is detailed in the Asymco Interactive data sets on a quarterly basis) and the forecast based on the given compound growth rate published. Nokia (or more precisely Symbian) share will be swapped for Windows Phone. The transition period 2011 to 2015 shows approximately 150 million Symbian devices will be sold which is the stated goal for Nokia. IDC is making an assumption that the hardware vendors will roughly maintain their respective shares irrespective of platform dynamics and that Nokia will switch its share of users from one platform to another in a predictable way. iOS and BlackBerry will maintain share. Presumably this is also driven by hardware channel dynamics and relationships with carriers. 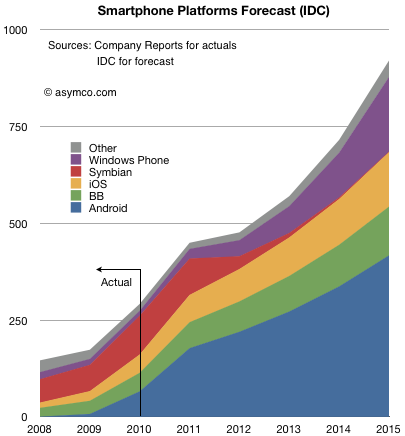 Android will grow share slightly but the vast bulk of growth will come from market growth. Market growth is strong but undramatic. Overall this is not a controversial set of assumptions. Except perhaps that it assumes that the basis of competition in the market is unchanging. Of course it’s well understood that the basis has shifted during the tumultuous 2007 to 2010 and forecasts made before the iPhone was launched sound absurd today. But IDC says that the unpleasantness won’t happen again. From listening to the conversations going on today on this blog and elsewhere, their assumption that things will not change (again) is fairly deeply ingrained, indeed conventional wisdom. In that sense IDC is not taking any liberties with the future. The projections of current realities onto the future leads to this type of forecast and status quo defenders should be satisfied, if not rejoice. However, there are a few more consequences of even this uncontroversial forecast which should make keen observers sit up and notice. If we look at more than the before and after snapshots and comfortable pie-splitting sound-bites there are some profound seismic things being implied. Android is considered likely to break one billion units in five years post-launch. Windows Phone will sell nearly half a billion units and Blackberry will be well over that number. No less than four platforms will have sold half-billion units by 2015. 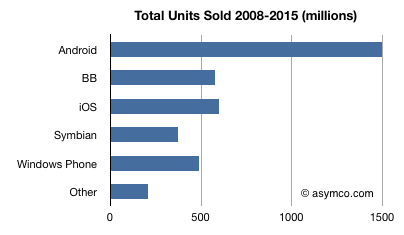 The suggestion that Android will “win” by having the most units sold seems as hollow as the suggestion that Symbian “won” by having the most users in 2008. Not so much because it will go on to lose them, but because there were plenty of viable alternatives for users to buy and developers to build for. 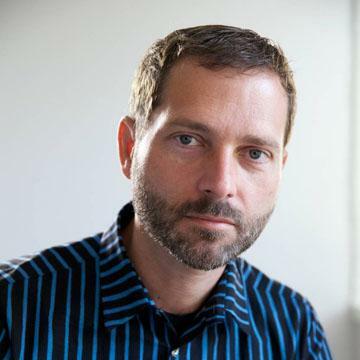 Half a billion users cannot be easily ignored. So even “safe” assumptions can lead to astonishing results in this market. Namely, IDC is saying that the smartphone market will not have any platform losers. In other words, there is a complete reversal being projected. An almost perfect flip: those on top end up at the bottom and those on the bottom end up on top. That’s about as controversial as it gets. Pretty impressive for a set of safe assumptions. You should ignore the shape of the curve between 2011 and 2015 as it assumes the CAGR is applied to every year. Although the press release shows a CAGR, the actual report may include various fluctuation in yearly growth. The starting point of 2011 and the end result in 2015 however should be the same. If, on the other hand, you believe that exponential growth, rapid gains in communications speed, new breakthroughs in interaction with devices, and entrants winning with new business models are causes for a disruption, then perhaps extrapolation may not be the way to forecast this market.